FILE - French President Emmanuel Macron delivers address at the Elysee Palace in Paris, Jan. 3, 2018. French President Emmanuel Macron will address the nation on Monday in response to massive, often violent rallies staged by "yellow-vest" protesters across the country for the past four weekends. "Very sad day & night in Paris. Maybe it’s time to end the ridiculous and extremely expensive Paris Agreement and return money back to the people in the form of lower taxes? The U.S. was way ahead of the curve on that and the only major country where emissions went down last year! " An earlier tweet from Trump insinuated that protesters in Paris sided with his decision to leave the Paris agreement — a landmark 2015 agreement between over one hundred countries to combat climate change. "The Paris Agreement isn’t working out so well for Paris. Protests and riots all over France. People do not want to pay large sums of money, much to third world countries (that are questionably run), in order to maybe protect the environment. Chanting “We Want Trump!” Love France." he wrote. Nearly 2,000 people were arrested Saturday across France in the latest round of "yellow-vest" protests. Protesters wearing yellow vests stand next to a burning tree as they demonstrate against the rising costs of living that they blame on high taxes near the Arc de Triomphe on the Champs-Elysees avenue in Paris, Dec. 8, 2018. On Saturday, French Interior Minister Christophe Castaner said violent outbreaks in Paris were "under control" despite ongoing disorderly acts he declared "totally unacceptable." 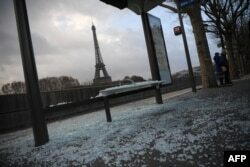 A picture taken in Paris, Dec. 9, 2018, shows a broken bus stop and (background) the Eiffel tower a day after a "yellow vest" protests as part of a fourth weekend of nationwide protests. 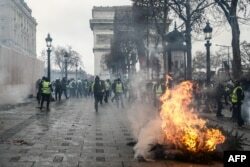 Many shops in Paris were boarded up before Saturday’s protests to avoid being smashed or looted, and police cordoned off many of the city’s broad boulevards. French Prime Minister Edouard Philippe called for new talks Saturday with representatives of the "yellow vest" movement. He vowed the government would address their concerns over rising living costs. "The president will speak, and will propose measures that will feed this dialogue," Philippe said in a televised statement. 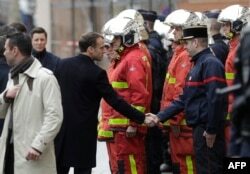 FILE - French President Emmanuel Macron (L) shakes hands with a firefighter during a visit in the streets of Paris on Dec. 2, 2018, a day after clashes during a protest of Yellow vests.